ALMA Observatory Antenna & Black Hole | Flickr - Photo Sharing! The ALMA (Atacama Large Millimeter/submillimeter Array) Observatory is composed by 66 Antennas and located in the Atacama Desert in Chile, at 5,000 meters (16,000 ft) elevation. There were many factors that motivated me to build this model: I am in love with science, in particular astronomy and space exploration, and a few days ago the first picture of a black hole was made and ALMA played a fundamental role in this enormous achievement. In addition, the ALMA Observatory is located in my country, Chile. The ALMA Observatory was part of the Event Horizon Telescope project, which achieved the first direct photograph of a black hole. ALMA is also being used in the study of the composition of comets and the formation of planets among other projects. The most complex part of this LEGO project was to built an accurate and robust parabolic dish in 1:50 scale. 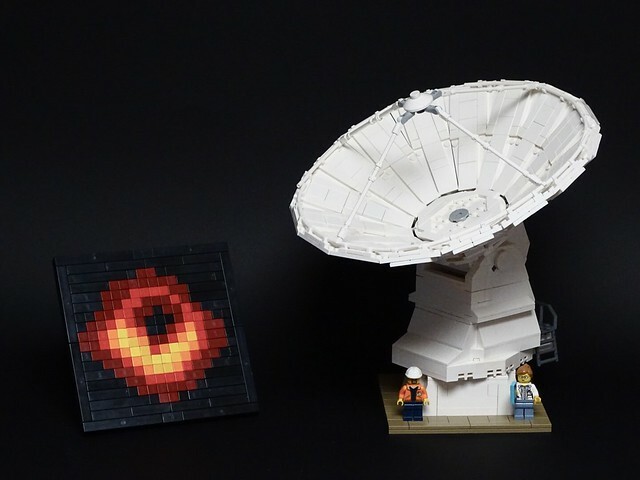 As a complement to the project I made a small mosaic of 18 x 18 studs that illustrates the historic first photograph of a black hole. Zenjii Oko, _Cocoa_, LegoExotics, and 60 other people added this photo to their favorites. W. Navarre Thank you very much! This is awesome! I supported it as lienad456 on Lego Ideas. thebrickccentric Thank you very much!